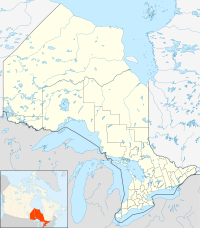 Red Rock is a township in Northwestern Ontario, Canada, located in the Thunder Bay District. The community of Red Rock sits on the shore of Lake Superior, about 10 miles west of the Nipigon River where it drains into Nipigon Bay on the north shore of Lake Superior. The population as of 2011 is 942. During the Second World War, a prisoner of war camp was established here housing primarily German prisoners. Many men returned to work in the mill or surrounding woods after the war. The Red Rock Folk Festival, held by the Live From the Rock Folk & Blues Society, is held each year. Red Rock's main source of employment is a kraft paper mill owned by Norampac. The mill originally consisted of two kraft paper machines but in late 2005 was reduced to running one machine. On August 31, 2006, Norampac announced the indefinite closure of the container board plant. This was due to unfavourable economic conditions such as the rising price of fibre, energy costs and the strengthening Canadian dollar. In September 2007 Norampac announced the sale of its Red Rock plant to American Logistic Services Inc. A new plywood mill was supposed to be operational by fall 2008, this deadline had been pushed back to spring 2009. The plans were ultimately cancelled however as the plant was torn down and the land was sold to Riversedge Developments in April 2015. There has been talk of constructing a sea port and biomass plant on the land, but it remains unclear whether this will be the case. ^ a b "Red Rock census profile". 2011 Census of Population. Statistics Canada. Retrieved 2012-03-29. ^ "2011 Community Profiles". 2011 Canadian Census. Statistics Canada. July 5, 2013. Retrieved 2012-03-29. ^ "2006 Community Profiles". 2006 Canadian Census. Statistics Canada. March 30, 2011. Retrieved 2011-04-25. This page was last edited on 11 December 2018, at 18:18 (UTC).